It can be really hard to find the right words and the positive thoughts when life just seems to keep handing you baskets and baskets of lemons. And let’s be honest- a lot of those pep talks that we see on instagram with flower backgrounds and calligraphy fall out of memory and by the wayside when you’re going through rough patches in your own life. On top of that, it can feel like you’re just the only person going through the throws-especially since people are only posting their best and happiest moments online for you to see. And sometimes, it looks like people have way more happier moments more times than not- and that can be a little crushing, to be honest. You have to remind yourself that everyone goes through ISH whether they broadcast it or not. Whether they post it or not. We are literally all in the process of becoming. I promise. This year has been the toughest year for me in a very long time, and there have been periods of months where my life was just a complete mess, and I felt so disempowered by the fact that when it rains, it pours. In fact, there was a period this year where I was running around San Francisco in my pajamas looking crazy, feeling crazy, and probably being crazy. This year specifically, has been a test in every single effort and area of my life– from career, to my relationship with boyfriend to relationship with parents to finances, health scares, overdraft fees two weeks before payday, cancelled gigs that affected my confidence to keep going, testy situations with friends, gossip and negative comments from community on how they see me- THE LIST GOES ON. Life is always going to hand you lemons, and you just gotta try and make lemonade, sis. Here’s five things to convince yourself that is a mixture of my hood sis and Gwyneth Paltrow. It was hard to find affirmations on the internet that weren’t so hippy trippy, so I improvised a bit. 1. Sometimes it’s not HOW to deal– sometimes you just have TO deal. As humans we are, in my opinion, experts naturally and instinctually on surviving. It is in our biological nature to ensure self-preservation. Every step into a street and the bus is too close for comfort? Chances are you aren’t connecting the dots, so much as your body has an immediate physical response to protect yourself. Sometimes, when we’re caught up in survival mode, or life-isnt-too-good-right-now mode, we can start going towards “How”? Better yet, we probably go to “Why”– but it’s not entirely accurate. “Why” is often way beyond our control, and we know it. It’s why we can have a mental debate with ourselves for hours on “why” things are in the state they are. So then we do this thing where we try to figure out “how” and it’s a toss up strategy- it can work for you and it can also work against you. But trying to tackle the “Why” in a less-than-happy state can just disempower you MORE. For example: Earlier this year, I went through the deepest depression I experienced in my life. I’ve shared this online before, and I think something that sabotaged my self care was I initially fixated on the WHY: I started searching for answers and they were bigger than I thought I could tackle. “Yes, WHY are you experiencing depression”? was my question. 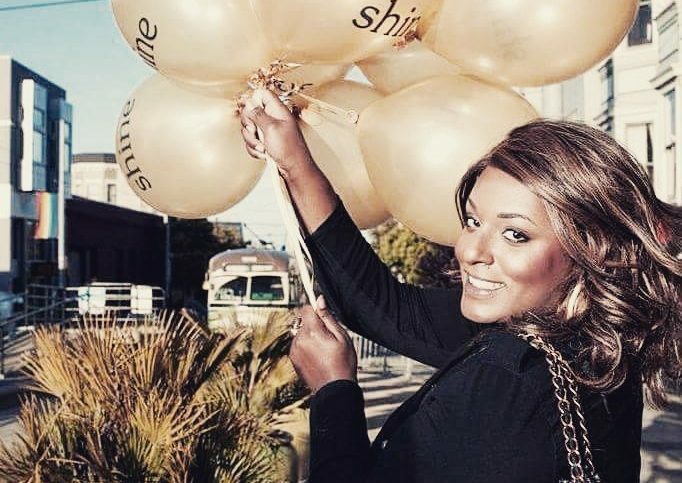 And sure, it’s probably not a shocker that a Black, Brown skinned plus size transgender woman is navigating depression. That made me even sadder. learning how to deal: my instinctual reaction was to try and solve the problems in my control. i was depressed and ready for a solution, and with all that was going on in my life I needed something that promised better days. But I self-sabotaged dealing with the problem head on, because I was trying to figure out how. “How am I experiencing depression like this when I don’t have anything to complain about or be sad about. I just got a new job at the top of my field. I live a charmed life. I have friends and family. I have awesome opportunities on the horizon. How am I depressed”. It just keeps digging a deeper hole. learning to deal: talking it out with someone was the obvious and most successful solution, and telling myself positive things to get to the other side of the rainbow. And initially I wasn’t ready, so I said it out loud, alone. That was the solution- dealing with the situation. The most obvious solution seemed so unattainable until I figured I just needed to deal, and figure out how to deal later. The real truth is, for most of us, others opinions don’t truly affect our lives completely enough for us to care about those opinions. Opinions hurt. And they stifle you. And rub you the wrong way. And everyone has one. But at the end of the day, who is responsible for who? You are the only guardian of your life and the reality is, sometimes you just have to dare to make yourself happy. Those who truly support you will come around. And everyone else? Well, they don’t really pay any of your bills. Wear what you want to wear. Be who you want to be. Live where you want to live. Date who you want to date. Like what you want to like. Are you living for YOU or are you living for other people? It’s true, and most of the time it doesn’t feel like it, and you can’t see why or how but it’s there. There’s a difference between hope and faith. Faith is that intuition that reminds you that there’s purpose, reason, and life is ebb and flow, and better things will come. The beauty of faith is that we have it all the time- all those dreams and aspirations guide us when they are not our actually reality. In trying times, that’s when faith kicks in, and that’s when it’s tested. Faith is looking in the mirror after months of depression, not recognizing yourself, and reminding your spirit that there has to be better days to come. Hope, on the other hand is an action word that kicks in when we’re on the cusp. Hope is literally EXPECTING better days, EXPECTING a better situation, EXPECTING that something soon will come to fulfill you into a better level than where you are now. I think when we’re a stress ball, we don’t factor in that we need to rest, especially when things are beyond our control and there are things in life causing you to be in survival mode or desperation mode. When I’m super stressed, or feeling blue I promise myself 30 minutes or more. Whether it’s a pint of ice cream and binge watching a TV show, or walking to the store, or breathing and listening to meditation music- make sure in the midst of your storm you Breathe. And Relax. You can probably deal with it tomorrow anyway. When I was younger, and my life was not going perfect- I didn’t know how to function. And to be honest, I didn’t quite learn all the other tips until I was older. But something I’m grateful for is back then- especially (I’m sure I was less jaded) I always found a way to laugh. I look back on those moments like “damn those were good times”, and then I recall that those “good times” were also times I was homeless, sleeping on the train with no coins. I will say that the world today is so much darker than it was- and when life is connected to social media it is becoming harder and harder to smile with the current events of the world, and the current events of your own life. And Facebook’s mood-changing algorithm experiments. Get stoned and laugh. Look up stupid prank videos on Youtube that involve pepper spray. Watch a stupid comedy on netflix. Something. To. Make. You. Laugh.